Teams of divers are painstakingly lifting an artificial reef made o f tens of thousands of old car tyres from the seafloor south of France, after it was found to spread pollution from toxic chemicals. The operation is costing well over a million euros ($1.1m; Â£898,000) and is part-funded by the tyre manufacturer Michelin as well as the French state. Local fishing association leader Denis Genovese told AFP news agency that some types of fish swam around the collection of tyres, while "no species really got used to it". Once upon a time it was seen as a double solution - a way to get rid of old tyres, while creating habitats for marine life and stimulating marine organisms to grow on the rubber. In the 1980s local authorities agreed 25,000 tyres should be sunk into the waters 500m (1,640 feet) from the shore between Cannes and Antibes, on the French Riviera. In 2005, researchers found the tyres were leaking chemicals including heavy metals - a risk to human life - into the environment. In 2015, authorities told journalists the tyres were thought to be "completely inert" and to present no risk at the time they were sunk. Another documented issue is that stacks of tyres can collapse or disintegrate, disturbing life in the area. A first set of 25,000 tyres was removed in 2015, with 10,000 set to be lifted in the coming weeks and more next year. 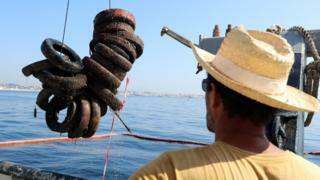 Artificial reefs u sing tyres have also been sunk in other parts of the world. Tens of thousands of tyres have been removed from the seabed at Fort Lauderdale, Florida. Around Gibraltar in the 1970s, the tyres were washed away by currents. Ships, cars and concrete blocks were later used instead. The US ambassador to the UN dismisses claims Gulf states and the US enabled a deadly attack in Iran. Will Trump bring 'America First' to UN?